Within a complex built between 1872-1911, the College of Architecture, Planning, and Design (APDesign) at Kansas State University (KSU) has risen in stature over the last decade among the nation’s graduate design programs. The only obstacle hindering APDesign’s continued forward momentum was the quality and condition of its facilities. The nondescript and opaque buildings did nothing to promote the APDesign program and its innovative design research to a broader audience. Located in the heart of the campus network, the facility is situated to become a hub of interdisciplinary interaction, engaging KSU in a unified expression of innovation, excellence, and sustainability. The new addition stitches together the two renovated historic buildings and is punctuated by “The Jewel,” a transparent, three-story social container and entry courtyard that assumes the new face of APDesign. 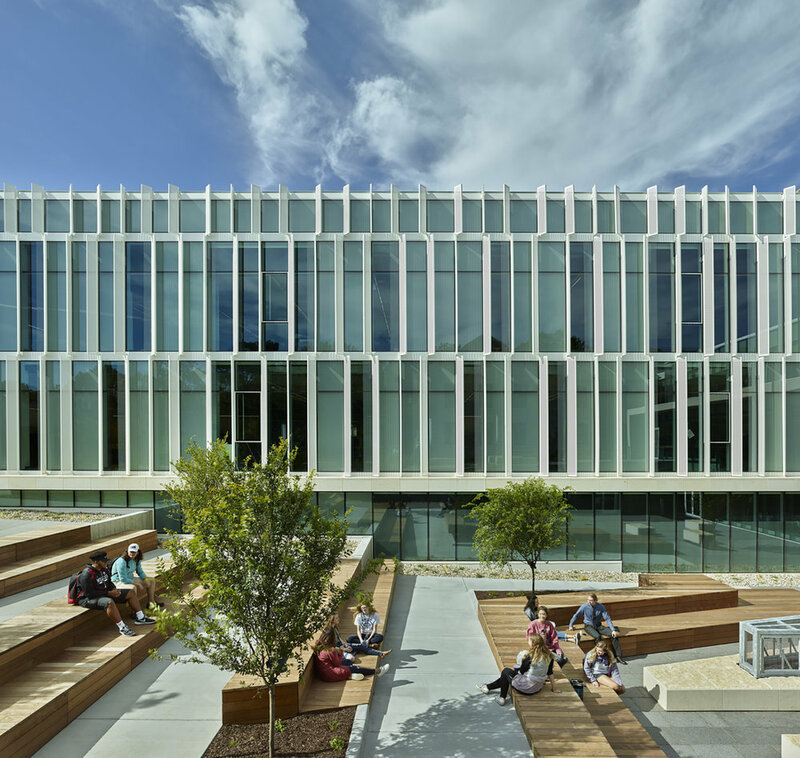 The new building and renovation of existing facilities are intentionally conceived to support the students and faculty as they explore the potential of design to impact human happiness, health, and experience. To respond to APDesign’s evolving pedagogy, the project includes new design studios, crit spaces, offices, a design library, a design gallery, a fabrication lab, a 300-person auditorium, and an open “design living room” that engages the broader university community. The existing buildings are significant pieces of history, with Mechanics Hall being the oldest standing university building in the state of Kansas. A careful selection of materials enhances the buildings’ aesthetics and functionality while still being mindful of their history. The team used a durable, light wood flooring to complement the existing buildings and a mill-finish steel expression on the guardrail, stair, and base to represent strength and modernity. The aesthetic of the Jewel also harmonizes with the existing buildings, with an intentionally low massing that aligns with the dominant datum lines of Seaton East and Mechanics Hall. Creating a cohesive historic and contemporary architecture, the new APDesign facility stimulates a vibrant discourse with history while expressing the program’s contemporary values.